The two big stories emanating from testing in Barcelona this week have been the McLaren's lack of pace and the Brawn GP's speed from its first outing onwards. Theories on McLaren have abounded but Mercedes' Norbert Haug has given the "problems" camp a boost with his admission today that the car is not behaving as well as expected. There is time yet for the team to fix the problem, however, with a four day test at Jerez scheduled for next week and it would be a brave commentator who writes them off at this stage. Any team can run into difficulties when a new design first hits the road, so McLaren's problem should not surprise us too much. The really big news is the pace of the Brawn BGP 001; can anyone say with complete honesty that this was to be expected? After a season arguing with Force India over last spot on the grid and a winter of doubt and confusion, it is only natural that the most optimistic of us should have hoped for little better than midfield pace. Thoughts of light fuel loads to impress potential sponsors are dispelled by Ross Brawn's measured comments today - the team is in no hurry to acquire new backers, thereby implying that there is sufficient money available to compete for the time being. Testing may be a poor yardstick but there is still good publicity in being fastest each day. Let us not forget the impressive speed and consistency of the Toyota TF109 throughout the tests. Both Toyota drivers have set good times on the circuits used so far and observers are increasingly pointing at the team as contenders for the coming season. Don't say I didn't warn you! Ferrari remain the team to beat, with both Raikkonen and Massa setting good times when they feel like it, and BMW play their usual game of "now you see it, now you don't" - they will be competitive when the times comes, I'm sure. The Williams FW31 has been quick when the team want it to be but is not really a front runner yet. Renault and Red Bull are slightly disappointing; Alonso might put in a quick one now and then but the general impression is that Renault has a lot of work to do yet. And Adrian Newey's RB5 seems less than a world beater, even in the hands of Sebastian Vettel. Scuderia Toro Rosso have had a few problems with their version of Newey's design; after limited running, the STR4 is not quite as fast as its sister car. 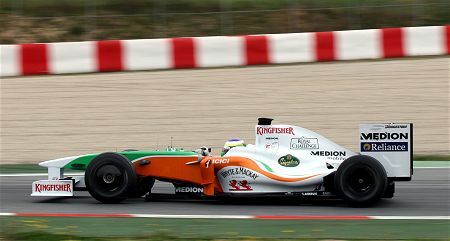 In contrast, Force India has surprised somewhat by being able to run with the midfield teams and that leaves me at a loss to suggest a tail end charlie for 2009. At present that would be McLaren but I really cannot believe such a situation will continue. The afternoon session continues and I will add the final times when the session is over. It seems the more I read about this year's testing it becomes a case of the more you know the more you know you don't know. This is truly a weird pre-season. The notion that McLaren and Toyota might swap places is indeed hard to believe. But it would be amusing if Toyota really got a winning car in the year they were forced to slash their budget. Steven: How true - and we know a lot this off season, it seems! Filipe: Ah, the irony. Cost cutting might have more far-reaching effects than we had ever imagined. I'm willing to go with Steve. It seems that each time there is a big change in the regulations, the season will be a messy one. I remember 1989, the first year without the Turbos, and there were six winners and 29 drivers in the points. I'm not surprised if all 20 drivers will get their points. That would be a first! I'm not that surprised that Brawn are quick. Honda had reputedly the biggest budget in F1 last year, and wrote off their '08 car to concentrate their resources on the '09 one, plus with Ross Brawn at the helm, I would've been more surprised if it was slow. The shake-up in regulations gives teams like Brawn/Honda a chance to take a big step forwards, which it seems they've taken. The change from a Honda lump to a Merc would pose more problems for reliability than outright pace I would've thought. I agree that Toyota look VERY promising. Potential title challengers perhaps? I'm actually a little disappointed with the pace of the Red Bull. I thought their innovative design would've shown a bit more in testing than it has. Maybe they're sandbagging too (he says hopefully)? Whatever happens, it certainly looks like being an interesting season! Let's see now. McLaren test the car all winter and end up with a pig of a car. Honda do no testing, receive the same drive train, reportedly much later and immediately go to, or near the front of the pack? Nobody else smell something fishy? Interesting pre-season indeed. Both the Force India and the Brawn are up on the McLaren right now with the same drive train. Shenanigans on the part of McLaren.....maybe. Ferrari is having their typical quick and fragile pre-season. Toyota (Yeah) and BMW (Another Yeah) look fast and reliable. As much as I love 'Big Red', I would love to see some parity and find out there are 4-5 teams capable of winning races this year. That would be 8-10 different drivers who have a reasonable chance of winning any given race. I am torn between who on Ferrari I would like to have the better season. That depends on the way the season plays out. Kimi, I believe will bounce back and do better then last year. Felipe has won me over with his determination the last few years. Even though he does still make mistakes, the team clearly let him down last year. He did a good job of driving the car. My ideal season would be McLaren, Ferrari, BMW-Sauber, Renault and possibly Red Bull or Williams capable of winning races. But what the hey, I'll take Brawn or Toyota on the top step of the podium if it means an end to the McLaren/Ferrari stranglehold of the last 2 years. I would love to see Braun GP up near the top as it is always nice to see underdogs succeed. However I think they are more likely going to end up midfield at best. Interestingly comments by Mark Webber have pointed out an obvious but completely overlooked point (at least by myself). The most important aspect of testing is not the quick one off times but the consistency of reasonable times over many laps. It seems that some cars are going very quick for a few laps but are wearing their tyres very badly while others are going slower but their tyres are holding out. In previous years this would not too bad a problem as if you could get out in front you could then keep the cars behind, but this year it will be different. If a car is wearing its tyres badly then it will be much easier for other cars to get past through a combination of the aeros and the random speed boosts. Perhaps Maclaren have been tuning for tyre wear and getting the speed performance data from the other mercedes powered teams. It is also interesting that renault are complaining about a few teams bending the new design rules. If they complain officialy and it is upheld then those teams (Williams and Toyota) would suffer major setbacks. Timbo: What I love about Ross Brawn is his ability to crush the others with a few words. Far from being surprised at the Brawn BGP's pace, he said he was amazed at how slow the other teams were! Nick: Ah, the first conspiracy theory of the year! Must admit that it's too complicated for me, Nick - I'll stick with the McLaren being a dog and Honda having got it right through Brawn's influence and a longer design time. Aracer: As much as I had my doubts about Kimi during 2008, I'd like to see him do well this year. He is so good to watch when he's really trying. Peril: Agreed, although I'd like to see Renault and Williams swap places in your list. But you're right - you can't count that man Alonso out. Lee: Good point about tyre wear. The long runs in testing are where we see the real pace of the cars. Ferrari are always good at this but the Brawn is reported to be quick on them too. If I were running Williams or Toyota, I'd be worried by the Flav's comments. It would be so typical of the FIA, after having been uncommitted over the winter, to ban the dodgy diffusers after the Melbourne race. Charlie Whiting has had a close look at them, apparently, but he hasn't said anything definite about whether they're legal. Going by previous events, it would be unwise to set too much store by what he says anyway - it's how the FIA want to mess with the championship that counts. Wouldn't it be the peak of stupidity to allow Toyota and Williams to test all preseason with their diffusers and then declare them to be illegal in Oz? Which is why that is exactly what the FIA will probably do. Then Toyota will be so cheesed off they will withdraw from F1 on the spot. After all they won't be able to test a new design then. Nobody inside F1 really wants to see Toyota succeed anyway. I suspect the grid in Melbourne will look something like the grid in Brazil a few months ago. Testing really means nothing, since you don't know if they are running hard for the full lap or just doing sector times. You don't know how much fuel they are carrying. You don't even know if they are looking for the ultimate set-up or just trying different things to see how the car responds. Let's get to a serious race soon, OK?